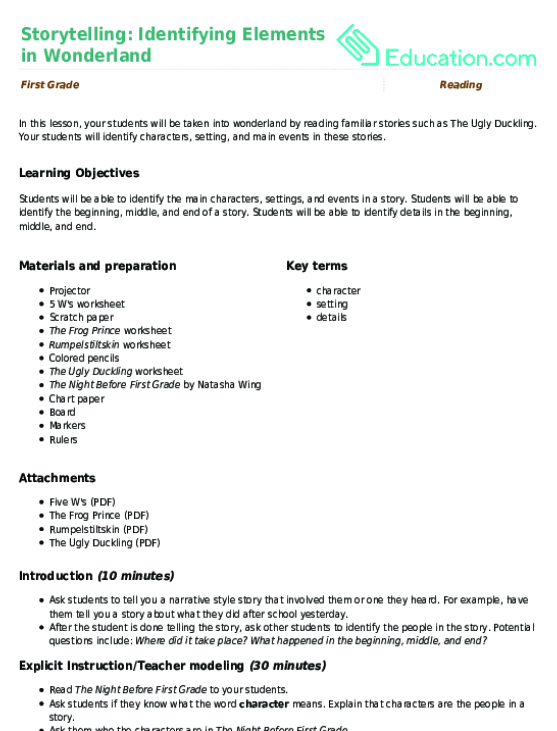 Students will be able to identify the main characters, settings, and events in a story. Students will be able to identify the beginning, middle, and end of a story. Students will be able to identify details in the beginning, middle, and end. Ask students to tell you a narrative style story that involved them or one they heard. For example, have them tell you a story about what they did after school yesterday. After the student is done telling the story, ask other students to identify the people in the story. Potential questions include: Where did it take place? What happened in the beginning, middle, and end? 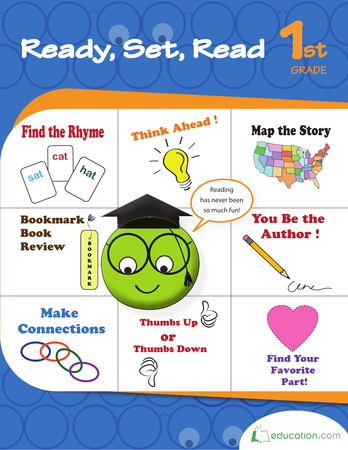 Read The Night Before year twoTo your students. Ask students if they know what the word CharacterMeans. Explain that characters are the people in a story. Ask them who the characters are in The Night Before year two. Write CharacterAnd SettingUsing a 2 column chart on the board. Ask students if they know what a SettingIs. Explain that setting is the place where the story occurs. Ask the class the setting of the story, and fill this in the chart. Create 3 bubbles on the board with an additional bubble attached to each bubble. Ask students what happens in the beginning, middle, and end. Fill in the 3 main bubbles. Explain that DetailsHelp people imagine the main events. Instruct your students to come up with a detail for the beginning, middle, and end. 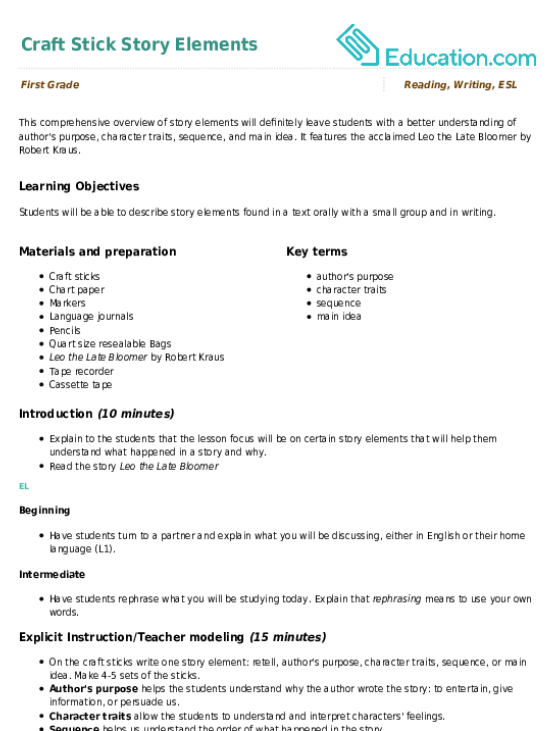 Fill in the attached bubbles. Have your students divide their papers into two sections using rulers. Instruct your students to write CharacterIn the first box and write the people or animals in the story. Model this on the board. Direct your students to write SettingIn the box below the first one and write the place where the story takes place. Have your students flip the paper and divide the paper into thirds. Instruct the students to further divide the paper into sixths. Instruct your students to put BeginningIn the first block and DetailIn the one next to it. Do this as well for MiddleAnd End. 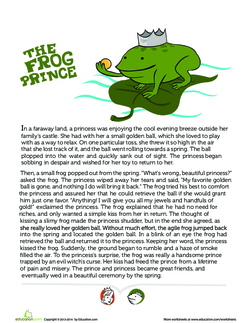 Instruct students to read The Frog Prince worksheet with a partner. After that, fill in the chart. Have your students work together to come up with answers. Read the story out loud and invite students to say the answers they wrote. 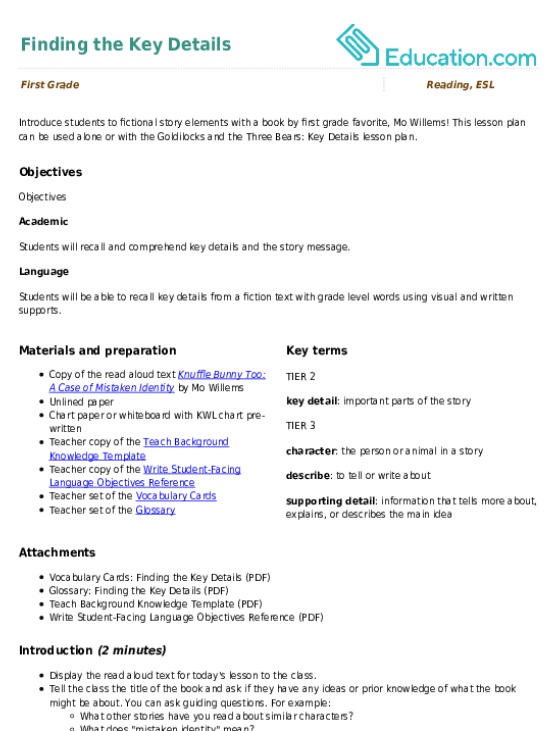 Instruct students to complete the 5 W's worksheet. Remind students to answer in complete sentences. Set the timer to 15 minutes. Read the text as a class and invite students to come write the answers on the board. 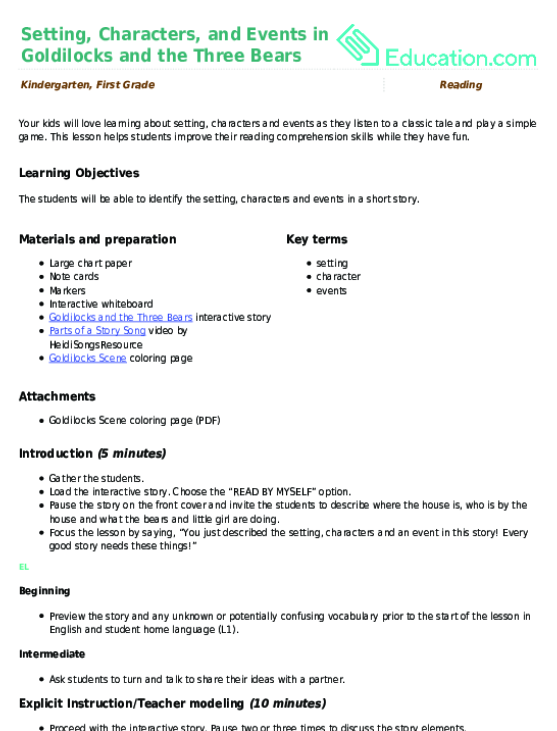 Enrichment:Instruct students to write a story. Ask your students to circle the characters in red and setting in blue. Direct your students to underline details in green and the beginning, middle, and end in purple. 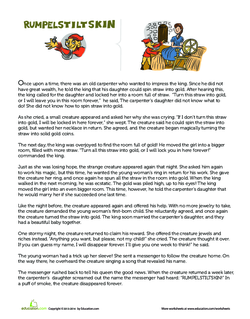 Support:Read the Rumpelstiltskin worksheet. Ask students to summarize the story at the end of each paragraph. Have students write and draw the characters and the setting. Instruct students to write the beginning, middle, and end of a story. Direct your students to write about a time when they went to one of these places: zoo, park, museum, library, or water park. Ask your students to write the setting and characters. 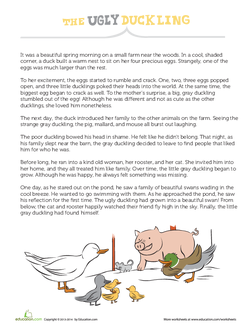 Read the The Ugly Duckling worksheet aloud. Ask students to identify the characters, setting, beginning, middle, end, and details for each.